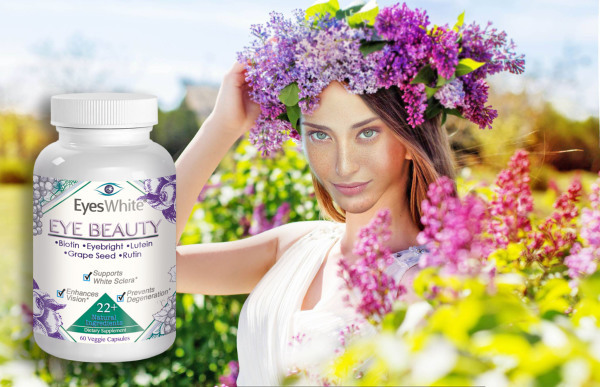 Eyes white is a woman's eyes beauty vitamin ★BE A BEAUTIFUL YOU★ They say the eyes are the windows to the soul, so shouldn't your eyes be healthy and beautiful? Toxins and impurities built up in your body and eyes can cause your eye's sclera to have a dull or yellowish appearance, instead of a bright white color that is an indication of good eye health and also of overall health. 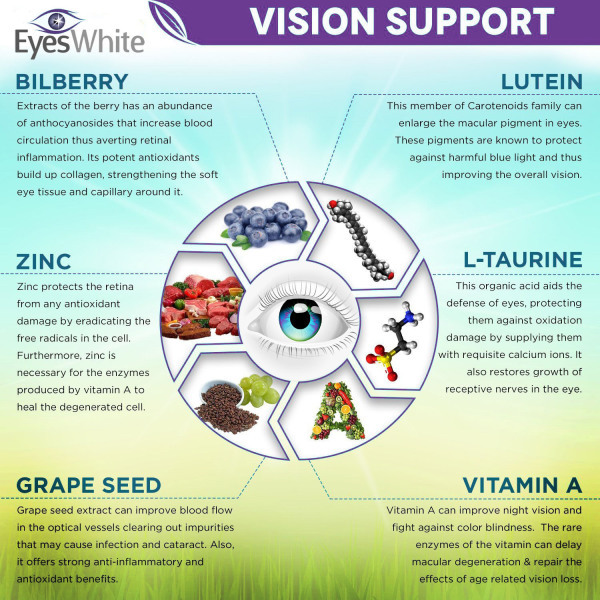 NATURAL AND SAFE INGREDIENTS •EyesWhite Eye Whitening Pills contain natural ingredients and vitamins such as lutein, calcium, bilberry, eyebright, quercetin and ruin, with our extra formulation of grape seed extract help support vision health and powerful natural whitening formulation. Bilberry, known as the European blueberry, features naturally occurring anthocyanidins, which are powerful free-radical fighters and help strengthen veins.Together with bioflavonoids rutin and quercetin, these botanicals offer a comprehensive protection plan for the precious health of the care of your eyes health and beauty for eye whitening and eye brightening. 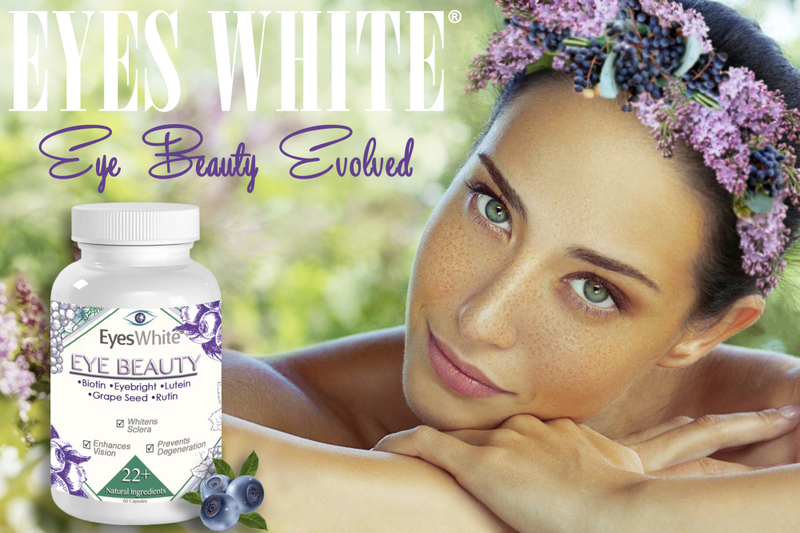 • EyesWhite is formulated with clinically researched and studied ingredients and is made in the USA at an FDA-inspected facility with strict GMP standards. Why Us? Get The Most Powerful Product. Beauty and Health, with its unrivaled ingredient profile of over 22+ ingredients, we have emerged as the eye health market leader. We wanted to create something that was completely safe, and utterly potent; the most elegant solution to helping the body improve eye health, beauty and sclera whitening. Get Lightning-quick Shipping. All of our products are stored by Amazon, which means that prompt and secure shipping is guaranteed. Amazon Prime users get second-day free shipping! Get Results or Your Money Back. With our no-questions-asked Money Back Guarantee, you're always covered. Also, as customer satisfaction is our number one priority, we offer round-the-clock support. If you ever have a query or concern, please don't hesitate to contact us. We took special care in making our Formula. It’s made of natural compounds, amino acids, and the best vitamins for eyebeauty, health and function. EyesWhite® is designed to deliver immediate and long-term benefits. Over 50 years of science research was analyzed to design the safest and most effective formula for healthier and beautiful eyes. EyesWhite® is manufactured in a state of the art GMP certified laboratory using the highest industry standards. Each batch is purity tested to ensure that only the finest is delivered to your door. 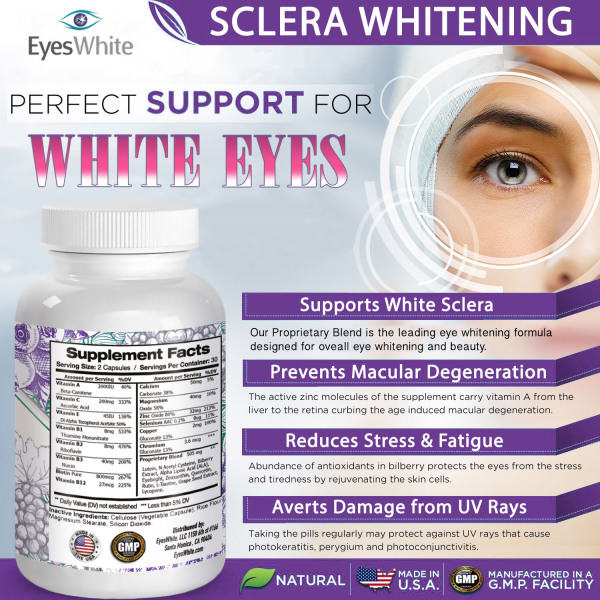 We give you the perfect combination of natural eye whitening and health ingredients. Our Proprietary blend is a leading eye formula that supports white sclera. The active zinc molecules carry vitamin A from the liver to the retina curbing age-induced macular degeneration. An abundance of antioxidants in bilberry protects the eyes from stress and tiredness by rejuvenating the skin cells, reducing eye stress & Fatigue. These statements have not been evaluated by the Food and Drug Administration (FDA). Use only as directed. This product is not intended to diagnose, treat, cure, or prevent any disease or as a prescription for medication. Please read all packaging and labels carefully. Always consult your physician or healthcare provider before taking any supplement. If you have or suspect that you have a medical problem, please consult your physician or healthcare provider. The contents of this website are for informational purposes only. Not for use by children under the age of 18. We created a comprehensive eye formula with quality ingredients to make you look your best. extracts from the berry have an abundance of anthocyanosides that increase blood circulation, adverting retinal inflammation. Its potent antioxidants build up collagen, strengthen the soft eye tissue and capillary around it. The member of carotenoids family can enlarge the macular pigment in the eyes. These pigments are known to protect against harmful blue light and improves overall vision. Zinc protects the retina from any antioxidant damage by eradicating the free radicals in the eye cell. Zinc is also needed for the enzymes produced by vitamin A to heal the degenerated cell. This organic acid aids the defense of eyes, protecting them against oxidation damage by supplying them with requisite calcium ions. This also restores the growth of reproductive nerves in the eye. Grape seed extract can improve blood flow in the optical vessels clearing out impurities that may cause infection and cataract. Also, it offers strong anti-inflammatory and antioxidant benefits.